I've come to really appreciate Ideals Books when it comes to celebrating the holidays with small children. They are kind of my automatic go-to source when I'm looking for a way to explain a holiday to my toddler. Their books are always simple and straightforward making concepts easy to grasp. So, naturally I was delighted to be given the opportunity to check out some of their board books on the topic of Thanksgiving. Today Is Thanksgiving! is one of their board book and the story is told in rhyme. The book opens with two smiling children who are looking out their window, safe inside from the icicle breeze which is whipping the leaves around. The children troop down to the kitchen to find their parents deep in the thick of things when it comes to preparing the family's meal for the day. The children are remembering the Pilgrims and Indians, parades on tv, friends in the neighborhood who come over to play football (well, ok, we don't do that exactly), family and full bellies. 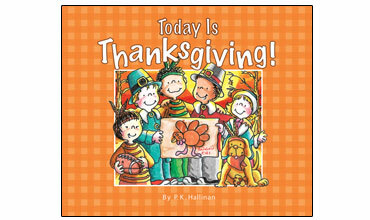 This book is a fun look at Thanksgiving and just hits on the various traditions that families have in celebrating the day. What Is Thanksgiving? asks the question of the meaning behind the day. Is it all of the activities mentioned in the aforementioned book? Is it the food? The friends? The family? Ultimately this book lets the young reader know that no, it isn't about the things or the particulars of the day. It's about remembering to be thankful to God for the blessings that He has poured out over our lives. Yes, Thanksgiving day itself is fun and full of treasured traditions, etc. But this book reminds the reader that we need to look to the source of these individual gifts. Obviously I have no complaints about the conclusion that this particular title has drawn. Very strong and definite Christian message if you are looking for something along those lines. I'm so glad that Ideals Books is bringing this story back! It is a perfect read aloud for the Thanksgiving season and so I'm extremely delighted to inform you that Ideals Books has offered a copy of An Old-Fashioned Thanksgiving to one of you! THIS CONTEST IS NOW CLOSED. THE WINNER, selected by Random.org, is #7 - Serena! Happy (Early) Thanksgiving to you and yours! Thanks for the recommendations! I bought my daughter the Easter companion (I guess you would call it) to What is Thanksgiving? It talks about many of the traditions but focuses on the reason for Easter. Looks like some more books to add to our collection. Thanksgiving comes at such a beautiful,cozy time of year. I would love to read this book to my girls- thanks for the giveaway! Great book! My kids would love it!! 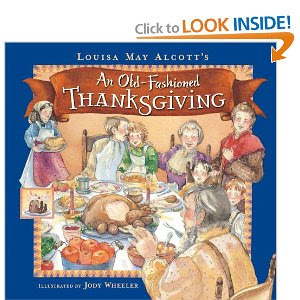 I'm always looking for more Thanksgiving books, they're harder to find. I think we have the Easter one from that series. Great recommendations! I watched the movie of An Old Fashioned Thanksgiving last year. Now you have me interested in reading the book! Thanks for hosting this give away. Thanks for featuring these, Carrie. Good Thanksgiving books are hard to find :). An Old-Fashioned Thanksgiving sounds wonderful! Thanks for the giveaway. Thanks for the giveaway. please include me in this giveaway. I love Thanksgiving! Thanks for the book recommendations, and we'd love to add one to our collection! I'd love to add more Thanksgiving books to our collection! I love holiday books. Thanks for the chance to win. I would love to read this book with my daughter. Thanks for the giveaway. We are such bookworms in our house! My kiddos would adore this! Thanks for the chance to win! My 1st grade students would love all of these!!!! I would love to win! As a teacher I always spend some time talking about Thanksgiving with my students. Sounds like a great book! Thank you for the chance to win. My little guys ages 5 and 3 would LOVE this. Please include me! 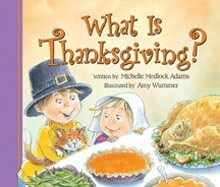 I think this would be a great book for kids to stop and think about what Thanksgiving is all about. This would be a great addition to my DIL's niece's little library. Hey, Carrie! This book sounds great! Please enter me in this giveaway. I would love to have this to read to my boys!!! I wouldn't mind owning a copy of it! I have been looking for some good Thanksgiving books to read to my son. These sound great. I have two little ones - this would be great for them. Count me in and thank you. What a fun give-away. I've been looking for some good read-alouds for Thanksgiving. Please count me in on the give-away. And thank you for it!